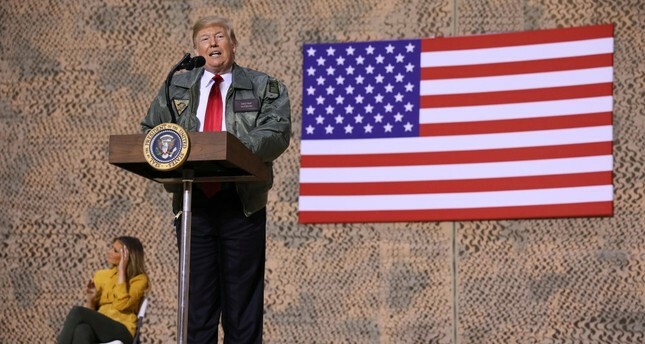 U.S. President Donald Trump delivers a speech to American troops in an unannounced visit to Al Asad Air Base, Iraq, Dec. 26, 2018. Amid debates whether the U.S. will pull its troops from Syria and whether Israel will become more aggressive in the region, their main concerns remain centered on Iran. U.S. President Donald Trump said over the weekend that the U.S. troops must remain in Iraq to watch Iran while Israel Defense Forces' Chief of Staff Lt. Gen. Gadi Eisenkot confirmed that Israel armed opposition groups fighting Iran-backed forces in Golan Heights. In an interview with CBS on Sunday, Trump said his country had to stay in Iraq because "Iran was a real problem." "I want to be able to watch Iran. All I want to do is be able to watch. We have an unbelievable and expensive military base built in Iraq. It's perfectly situated for looking at all over different parts of the troubled Middle East rather than pulling up," he said. He added that the troubles that the U.S. faces in the Middle East are caused by Iran. Accusing Tehran of killing people and being "vicious," the U.S. president said Iran was "the number one terrorist nation in the world." Since Trump took office, he has been accusing Iran and its proxies of financing terror groups and posing a national security threat to the U.S. Similarly, Israel has gradually harshened its tone against Iran, even targeting some Iranian positions in Syria. Israel had declared that it was disappointed with so-called nuke deal with Iran, signed by the U.S., Germany, France, China, Russia and the U.K. in 2015. Trump annulled the deal. In the interview, Trump said, "It was a horrible deal done by President [Barack] Obama and John Kerry that didn't know what the hell he was doing." Israel is concerned with Iranian expansion in Syria and Lebanon, claiming that Hezbollah has chemical weapons as well as long-range missiles. Mostly staying out of the crisis in Syria, Israel's primary reservation was that an Iranian presence would become permanent in regime-controlled areas. After the U.S. decision to leave Syria, several Israeli officials said their country was ready to prevent Iranian expansion. Since the beginning of the war in Syria, Israel has carried out airstrikes on certain positions yet remained silent and avoided any claim. Recently, the Israeli officials admitted and confirmed that they were targeting Iranian positions in Syria and arming the opposition groups, who were fighting against the Bashar Assad regime, Iran and its proxies. On the Iranian side, Tehran has responded with threats to the U.S. and Israel. Over the weekend, Iran claimed to have tested a new long-range cruise missile. The new missile was shown on state television to mark the anniversary of the 1979 Islamic Revolution. Claiming that the new test was successful, Iranian Defense Minister Amir Hatami said, "This cruise missile needs a very short prep time and can fly at a low altitude."